Let’s not kid ourselves: we’re in a wage negotiation. We’ve got to make the professions face up to the change that is inevitable. If I’ve offended anybody by the odd phrase, well, I get the odd phrase thrown at me as well. … you’re going to have to hurt the poorest and most disadvantaged. we could make some kind of agreement about where legal aid fits into our system. But McNally was as ebullient as he was emollient. I have a right to ask the solicitors’ profession to organise itself as efficiently as possible to deliver what the taxpayer is paying for. The vested interest is the one we all have: having a well run and properly funded justice system … It’s not a battle over our wages as has been described. there is a risk – a very substantial one in our view – that the provision of criminal justice will be wrecked by these proposals. they’re not going to “buckle” – so why are we doing it? We believe PCT is wrong, so we’re not going to help design the PCT scheme. She reminded the audience that the Liberal Democrats has been completely opposed to these sorts of legal aid cuts before the election. An important political point was raised by Paul Mendelle QC from the floor about Labour’s position. Since Labour had been in favour of proposals similar to these and had now changed its mind, what was to stop it changing its mind again if it regained power? Paul Mendelle was clearly looking for the sort of honesty I too have asked of Labour. 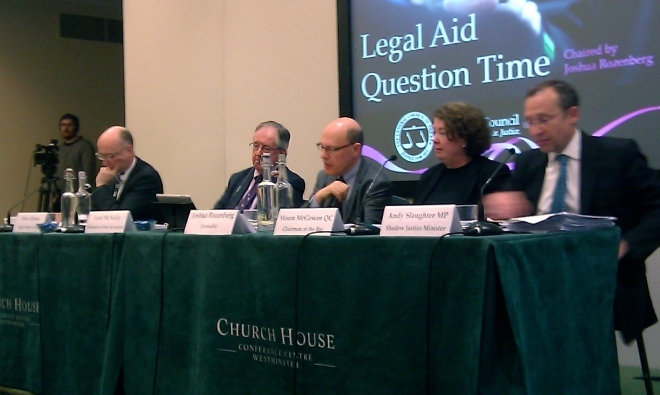 We’d have made cuts in legal aid – it’s a question of degree, and a question of how. degree, and choice of representation. Slaughter made pretty good use, though, of his chance to attack the government rhetorically. either red meat for the tabloids, or they’re playing to vested interests. That was all fair enough in a knockabout way – though I wonder how much it impressed Paul Mendelle. Slaughter did at one point put the legal aid debate into an interesting context, though, pointing out that he’s also been opposing government plans to bring in a £1200 total fee for bringing an unfair dismissal claim to an employment tribunal hearing. The government is not simply curtailing the rights of those who call on public funding, was his implication, but even those of private self-funders in a key area of civil law. I ask you just not to buy a pig in a poke from the other end of the table … whichever government comes in in 2015, if Sadiq [Khan] or Andy asks for £500 million back, they’ll get a short answer. Shouldn’t you be thinking about the structure of the profession where the bottom of the profession is left to BME and women? We don’t pretend to live in another century, nor do we structure the profession to ensure women and BME get lower-paid work. It’s not tue that only larger firms can be more efficient … small can be beautiful. … of course larger firms want the volume. Client choice is the best determinant of quality in the system. the idea that the 20 year career criminal should get his choice of brief on the public payroll. by the minister’s assurances that he’s listening.The signal coming from McNally seemed to be that there might be room for some movement from the government – but not much, either on the scale of the cuts of the broad principles of the plan. I thought Steve Hynes’s ideas were interesting – perhaps because his position on the future of legal aid seems fairly similar to my own. I thought Maura McGowan pressed the legal aid lawyers’ case robustly and well, and was pleased Andy Slaughter was forced to and did address the debate with some of the honesty I want from Labour. To oppose the details of these cuts is fine, so long as the impression is not given that Labour would maintain the current level of spending, in the system as currently structured. It wouldn’t. As for Lord McNally, the minister made a brave and decent defence of his position – and his honest, occasionally gaffe-prone style shouldn’t be underestimated. His approach will I think help his case among the broader public – though it won’t impress legal aid lawyers. Many listening must have thought Lord McNally’s the one “living in a bubble”, to use his words, clearly directed at lawyers’ representatives. Here are some other write-ups of the event, from Save Justice, Gemma Blythe, Jon Mack and Richard Bentwood. Well a consultation implies there is a chance of change or even retraction of the proposed changes. Does anybody think there is any possibility changes might happen following this consultation? I think there’s some chance of changes and/or delay. I’m pretty sure cuts of roughly this scale will certainly happen and I think, in time, structural changes along these lines are likely too. But I think the consultation may represent the government’s “highest bid” and that they may give some concessions – indeed I imagine they have in mind a few they expect to offer at some point. I know these changes won’t need primary legislation but if cross-bench Lords can organise themselves to “pray against” secondary legislation implementing the changes, they could force some amendments, too. And of course the government does occasionally retreat at least temporarily – like Michael Gove over his English Baccalaureat plans. I think if that happened it’d be because MoJ realised the plans wouldn’t work. I’m not expert enough in the structure and economics of legal aid work to know how likely that is here – but given the nature of the proposed change, I think there must be some chance the bidding timetable and process could go badly wrong. Making the new PCT system work in crime seems to me a much bigger policy challenge for government that simply turning off the legal aid tap (as happened with the changes to the scope of civil legal aid). So I think changes are possible.